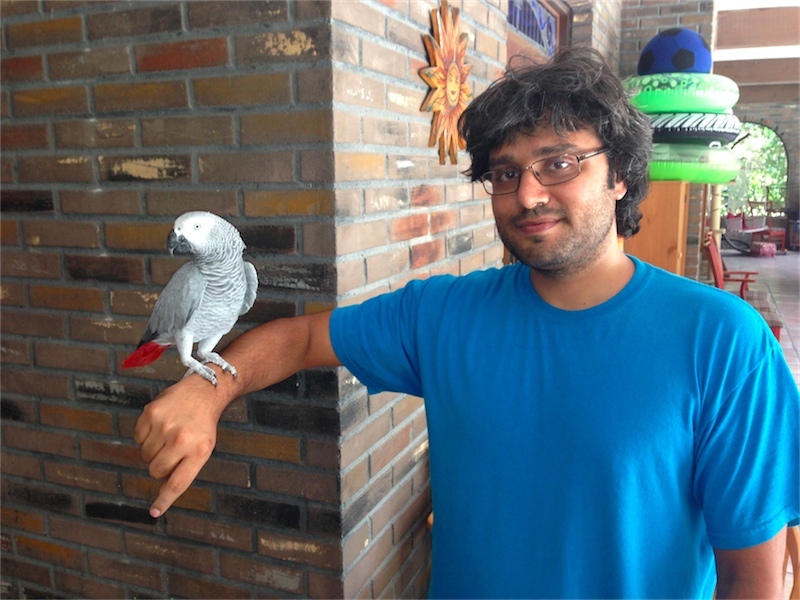 Last week, my friend Brian brought his African Grey parrot Marley to our house. We are taking care of Marley until Brian returns from vacation. Marley is staying in our porch and keeping the dogs, cats, and me thoroughly entertained. Throughout the day, he whistles and I whistle back. He has even tricked me a few times by reproducing my phone's ring tone and the home security alarm's door-open beeps. Speaking of birds, the ducks are getting quite devious. Despite being flightless ducks, they have managed to escape their habitat almost every day this week to chase the dogs. Yes, our ducks routinely glide out of their enclosure in order to scare the living daylights out of our Chihuahuas. While they do not actually hurt the dogs and just chase them playfully, it scares the dogs and we had to put a stop to it. Sunday before last I raised the height of their enclosure fence to three feet and after a week of no trouble, they figured out that if they took a running start and flapped their wings hard enough, they could just about clear the fence. So today I finally did what I have been trying my best to avoid - trim their flight feathers a.k.a. wing clipping. This makes them unable to gain altitude while still allowing them to glide down safely from a perch. The problem with having animals as pets is you face moral dilemmas on a nearly daily basis. From the very question of whether we should even "own" animals and keep them locked up in our domiciles to how much money should you spend to prolong the life of a loved pet, a pet owner constantly has to walk the fine line between what is humane and what is not. I thought that with time, my views about pet ownership would change but surprisingly have remained the same despite the 18 critters we have (19 until Marley goes back home). I do not believe in caging any free, wild creature, whether it is a common duck or a rare chameleon. Nature belongs in nature. I am vehemently against private ownership of exotic animals solely for entertainment purposes. However, I am perfectly ok with some exceptions - well cared for animals in nature preserves, rescue habitats, and limited number of good quality zoos. The three simple reasons for the exceptions are education, rehabilitation, and rehoming. Since our babies are re-homed from local animal shelters or pet-owners who could not take care of them, I have no qualms about giving rent-free residence to 3 cats, 2 dogs, 4 tortoises, 2 prairie dogs, 5 rabbits, and 2 ducks. Now that we have a veritable collection of mostly-tame wildlings, it is imperative that we take care of them to the best of our abilities even if appears unnatural at first glance. Sometimes that means separating the two boy bunnies because they keep fighting and sometimes that means trimming the feathers of ducks to prevent them from hurting themselves and our other pets. Don't worry, trimming the feathers is painless for the ducks and they grow back just like our nails. One thing we never try to do is change their nature. Prairie dogs like to dig. Ducks like to swim. Dogs like to bark. Cats like to scratch. And Marley likes to whistle. It would be inhumane to force an animal to go against their natural instinct just because it is inconvenient for us humans. We have worked hard to ensure that each of our pets has the perfect habitat to best suit their natural environment. And every now and then, they surprise us. Herbert and Phyllis the tortoises love eating purple flowers from the Petunia plants that we planted for shade. Prairie dogs love climbing high up on the metal mesh we used to build their enclosure. And Lola the tortoise loves swimming in the duck pond.